Change is often unwelcomed in business – especially when current ways of working are perfectly adequate. However, the process of changing to hosted voice services from traditional telephone systems is one that is beneficial in two ways. Firstly, the change is not going to be one that requires a monumental amount of work – if you’re got a business IT network, then you’ve essentially got 90% of the infrastructure that you’re going to need to get up and running with your new system – and the remaining 10% can be done with minimal disruption to your workspace. Beyond the immediate installation logistical requirements – you’ve got the benefit that comes from unifying your IT and telephony requirements – usually with an experiencedservice provider that can handle all your business network needs. This cuts down the disruption time that goes with making alterations to your phone system – and, in many cases, will mean that on-going configuration and management can be done remotely. Security is a subject increasingly in the limelight – and, with over 40% of businesses experiencing some form of cyber-attack each year – it’s right to have it on your radar if you’re thinking about routing your calls through your IT network. While the idea of exposing more of your data to the reaches of the internet might seem reckless – the opposite is actually true. When you de-centralise your telephony system and put its security in the hands of a managed IT network provider – you’re significantly increasing your defences. Cyber-criminals have, for a long time, favoured attacks on small-businesses vs. the prospect of trying to breach larger, more well-equipped companies. When you bring your telephony and IT requirements together, you’re handing them over to a company who will make assurances relating to ‘uptime’ and defence – meaning leaps forward in functionality – but no step back in terms of security. Increasing your security and decreasing the effort required to effectively manage your telephone systems might sound like something that comes with a difficult-to-swallow price tag – but, in actual fact, installing hosted voice systems is likely to save you significant amounts of money. Generally, you would expect to save 50%+ in terms of costs compared to current, traditional systems – and a big part of the reason relates again to how hosted voice works. It’s very unlikely that you’re going to be making any significant changes to your IT network to handle voice – so, you’ve already got the system in place. Of course, capital expenditure is just one aspect of your budget – and operational costs can far outweigh those over the course of the year – but here, hosted voice also excels. When it comes to altering or upgrading your system, you’re not going to require on-site engineers who’ll strip your building to lay infrastructure – in fact, you’re probably not going to need anyone on your site at all. Often, the service level agreement that you decide upon with your managed network provider will allow you a certain number of adjustments to your system – all done remotely – so, there’s no need to factor any additional works or running costs into your budget. 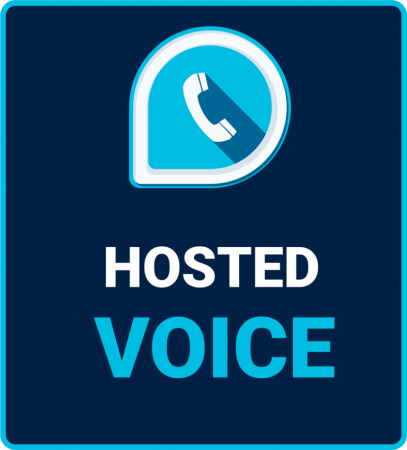 This list is very much about the benefits of hosted voice – but, since your business is unique – how can you be sure that benefits created with different businesses in mind will suit your requirements? Well, you can’t – but the good news is, hosted voice systems are so flexible – you can adjust the way they work for you, your end-users and your applications to make sure they offer an ideal solution. If you have a customer services operation, there’s a chance you record your calls –but there’s also a significant chance that you expect your end-users to sum up the call they’ve handled in your customer relationship account management (CRM) software – offering a quick glance recap for anyone else accessing the record. A hosted voice package could very well help you to streamline this process enormously. As data, your calls can be instantly held in storage that’s quickly referenced by your CRM application – what’s more, they could be transcribed in real time – offering a written recap of the call immediately available. From a productivity point of view, this kind of information handling is invaluable – and could increase call handling volumes enormously – while also ensuring that your data records are more accurate than ever before. …and many, many more. In fact, there are many companies who are developing their own platforms that allow full customisation of the interaction between your hosted voice data and company systems.